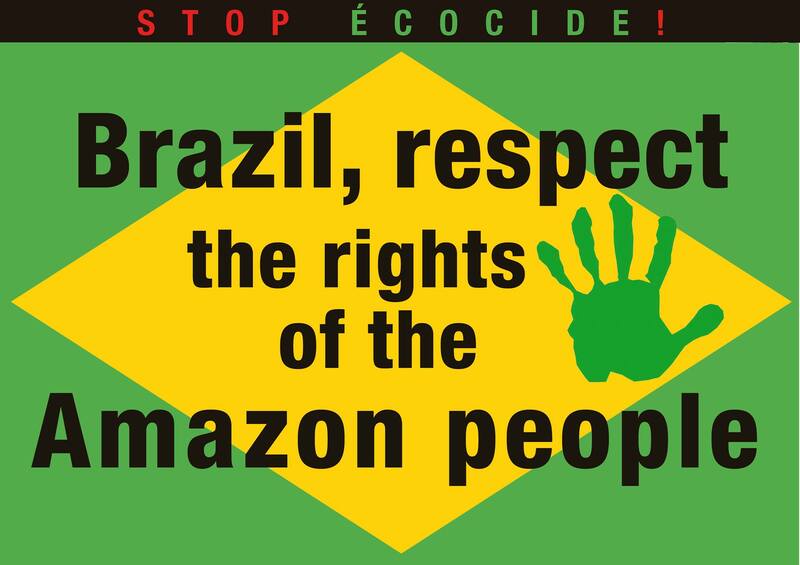 EVERYWHERE IN THE WORLD, YOU CAN PARTICIPATE RIGHT NOW IN THE INTERNATIONAL ACTION ‘STOP BELO MONTE’ ECOCIDE ! A poster to print out, a camera, a football field or another symbolic place next to where you live and you’re ready to go ! HOW ? By being photographed with the two visuals (A3 or A2 in color), one after the other, which we make available for you on simple request (info[at]planeteamazone.org), in front of a football field goal, a Brazilian consulate or embassy or the regional bureau of one of the companies implied in the construction of Belo Monte or other similar great dams in the Amazon. ATTENTION, your two photos must be close-ups, the message on the poster should be perfectly legible and your face can not be hidden. A kaleidoscope of all the photos will be published on the 10th December, World Human Rights Day and World Day for Action Against Belo Monte. 2) In any other city, have a photo of you taken in front of the local bureau of one of the companies implied in the construction of the Belomonte dam. Examples for Europe : Alstom, GDF-Suez, Mercedes-Benz, Siemens and Arcadis, or EDF, which wishes to participate in the future in the destructive great dams in the Amazon. Same recommendations as before : close-ups, company logo and poster’s text clearly legible and bare face. Finally, if you have neither embassy, consulate, nor bureau of one of these companies available to you, we invite you to have your photo taken on a football field, precisely in front of the goal. It is a strong message to send on the occasion of the Football World Cup of 2014, which will by the way be targeted by our next campaign. Contact us at this same address if you wish to obtain the files of the posters in high definition before printing them. Your complete name will not appear in the kaleidoscope we’ll publish. Only your first name, the first letter of your last name, your city and state or department will be indicated. Please communicate this information to us. If you live in a big city, the organizations mobilized on this international day of action, equally invite you to demonstrate, on this World Human Rights Day, in front of the Brazilian consulates. We do not hold ourselves responsible for these gatherings. Protecting our planet’s life-support system is vital. Beyond just protection, check out my web site, http://www.jimbell.com and click on the “Conscious & Knowledge” button. This 16 page paper lays out the key things the people living today have to accomplish to give our children and future generations their best chance to live in a peaceful, prosperous and life-support sustaining future. We have to change the route of human kind. We need to create new culture where we all learn to live ecological life with more happiness where we part of the environment ig. nature and with less stuff and things around us – like technology. We need to create new, better lifestyles with lots of love and we still hopefully can correct the dameges we humans have done to the globe. But we have to act now for the future of our, of our kids and their kids etc. !